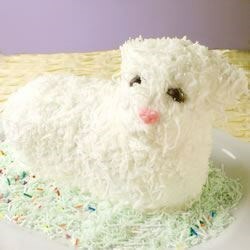 "This white cake is baked in a lamb mold for Easter and can be decorated to look like a little lamb. If desired, spices can be added just before adding the egg whites. Some good choices are anise, nutmeg or cinnamon." This recipe was really easy and tasty. It baked in the mold perfectly with no problems. It came out of the mold fine. I frosted it using a pastry bag. Frosting it took about 5 minutes!